Can you BEE-lieve it? The Richmond Library is now the proud owner of an observatory honey bee hive! It’s true that the Free Library is home to many unique and wonderful programs and initiatives – many of which you’d probably not expect to find within the walls of your neighborhood library – but perhaps none is more BUZZ-worthy (okay, okay, we’ll stop!) than our library’s latest undertaking! The Richmond Library was home to a feral honey bee hive above the front entrance for over 10 years. 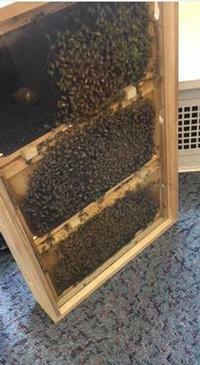 After I began my tenure as manager of our neighborhood library location, I felt that the bees presented a potential problem being located directly above the front door. After securing an exterminator, we learned that honey bees are now endangered and necessary for food production; therefore, traditional methods of insect extermination is prohibited. After consulting with Don Shump, CEO of the Philadelphia Bee Company, we learned that the colony consisted of more than 60,000 bees and over 100 pounds of honey! The only way to rid the branch of the bees was for Don to create a decoy hive to try to lure the bees out of our building’s masonry. Unfortunately, that did not prove to be successful, and as winter of 2017 approached, the bees became dormant. Don told us nothing could be done until the spring of 2018, when the hive would likely reactivate. As it turns out, over time and through a harsh winter, the library bees died off. During this process, we learned a lot about honey bee behavior and societies. Through pollination, bees help produce crops like nuts, fruits, and vegetables. It’s estimated that bees are responsible for one in every three bites of food in the United States! That’s a crop value of 15-18 billion pounds of food per year! We learned that environmental stress – such as warming earth temperatures and harsher winters – has resulted in a lack of pollen. As the bee production declines, so does our food supply. As our food supply diminishes, the cost of food increases. In an effort to promote understanding of the earth’s biodiversity and ecosystem, the Richmond Library has introduced honey bees to our community. Honey bee societies are models of the harmonious coexistence necessary to preserve our increasingly fragile environment. We hope that our hive of 10,000 honey bees will deepen public awareness of environmental issues for patrons of all ages! Both myself, the adult and teen librarian, and our children’s librarian, Meghan Dondero, are planning strategies for nature-inspired programming around the hives. Some of these programs include partnerships with the Pennsylvania Horticultural Society to learn what bee-friendly plants to grow in your yard. The Philadelphia Bee Company will teach us specifics of bee behaviors, how they communicate, and how necessary bees are to our planet. We’ll also be working with Greensgrow Farms for samples of raw honey, as well as local Philadelphia restaurateurs, who will show us how to cook with honey. We’d like to thank the Strategic Initiatives Office of the Free Library of Philadelphia for providing us with the start-up money for the installation of the observatory hive. The maintenance and care of the hive will come directly out of our grassroots money, which comes from generous customer donations, to make this hive a reality. We hope you’ll stop in and visit our latest "worker bees" very soon! And we hope that you’ll gain an appreciation for and understanding of the important of honey bees in our society, as we have over here at Richmond, even if it came about as a happy accident! You can learn more about Bees via our extensive Explore Topic which contains bee-centric titles in our catalog, websites, and even some trivia from our library staff! Bees in the library? Bees in the libary! Just curious - were you able to get the remaining honey out of the feral hive, or would it be impossible to remove since it was inside the wall? Hi, Claire. Due to the location of the feral hive inside the library masonry, we were unable to extract honey. It is doubtful that the hive would have contained any honey as the bees probably starved to death over the winter.